you know, i didn’t expect to like the recently released version of IE but i have to say it’s not that bad (for a microsoft product, heh). they’ve taken a lot of what i like about firefox and incorporated the features into IE like tabbed browsing and RSS feeds. but the main thing that i’m liking is their clear type feature that makes the text of webpages a lot more readable and pleasing to the eye. surprisingly a positive from the corporate giant microsoft. i’ll definitely use it a bit more on my laptop just for the clear type fonts. read more about the browser here. cyber-monday is just about over and you’re *still* looking for the best online deals for your holiday gift purchases? not to worry, www.StealDeals.net got you covered. they conveniently list out the all the great deals to be had on their front page under Steals of the Day and if you want to dig a little deeper, you can browse through their archived listings by category. and besides the listing of the best deals, the website also features online coupons so that you can save even more cash on your purchases. oh and don’t forget to sign up for their email newsletter so that you can get registered for their fabulous holiday giveaways. ahh, the wonders of online shopping. we, as shoppers reap the benefits, you know what i mean? better prices, the convenience of shopping at anytime and the ease of researching before you buy. N101 Nutrition is one of those online retailers that i like to shop from. N101 offers a vast selection of nutritional supplements, herbs and skin care products with great prices and a website chock full of helpful information about healthy living and the benefits of natural health and beauty products. not only do you get to save money on some great products but your health and your body benefit from your purchases as well. oh and don’t forget to enter the coupon code “PPPNEW” to save 10% on your first order. Can you hear me, the sound of my voice? — I ended up with 2 of these blowers. The first one I use twice, maybe 2 hours on it. I went to use it a third time and it would not start. I took it back because it was less then 30 days. Got another one. This one bropably has about 11 hours on it in total. I made it through last season. Used it twice this season and it will not start. Total junk. Will never by a Craftsman again. — I bought one at the end of last season. Used it twice to blow the lawn clean, maybe 50minutes total usage. It stoped running, it just stalled… It wouldn’t start back up so I went to sears and actually bought another one (i know, i know…stupid!) The second one lasted not even a month!!!! Maybe 3-4 hours tops! ..well, i shouldn’t be so hard on myself … all the negative online comments are pretty recent so i wouldn’t have seen all this stuff back when i was purchasing the leaf blower. and who’s to say that Sears isn’t just deleting some of the negative feedback left on their products? you know i love watching ABC’s Lost but even as a fan, i have to admit that some of the loose ends that are just left dangling sometimes can leave me a bit frustrated. that’s why it’s a bit of a relief to see that others on the net feel the same. the writers over at IGN.com just listed out their TOP 50 Lost Loose Ends. 50? yup, that’s right, according to IGN, there are at least 50 nagging little questions about Lost. 29) Where Was Desmond Hiding His Boat? 15) Why Do the Others Want Children? friday night’s gonna be a scorcher..
according to our local news website, friday night’s gonna be a scorcher!!! i don’t know, i’m getting the feeling that the weatherman’s prediction might be a little off there…. Love is all that matters..
i probably don’t need to remind you that the holiday gift giving season is almost upon us. but i will and while i’m at it i’ll also mention www.StealDeals.net, a great website that can help you save money when purchasing gifts for the holidays. StealDeals has all the latest in online sales, coupons, and bargains. the site is the go-to stop before doing any of your online shopping. the site is updated continuously with the latest deals and spotlights the best bargains in the Steals of the Day category. be sure to sign up for their email newsletter and get automatically registered for their holiday give away. with a website like this, you’ll never have to pay full price again! clean versions of albums have been available for years due to the restrictions placed by retailers like walmart. i never had the need or opportunity to listen to one but i assumed that the record producer/editor went back to the multi-tracks and dropped-out the offensive language in the songs. 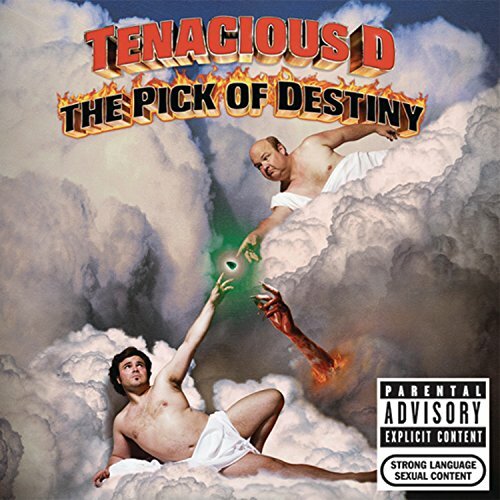 Well, the clean version of Tenacious D’s The Pick of Destiny (just released today) is the first that i’ve actually heard where the artist recorded alternative lyrics (or lines) in order to stay within the PG limits. my guess is that Jack Black is used to looping (ADR) in non-offensive language during his film shoots for network broadcasting and he must have brought that mind-set in for the clean version of this album. it’s actually a little weird hearing mother-truckers, buck-you and frickin’ this and that on a Tenacious D album. it’s just not right. i feel like i’m not getting the full effect here. and *no* i didn’t *purchase* the clean version. i was given one for reviewing purposes. and personally, i give it a thumbs down just for the fact that it was censored. but i give Jack Black and Kyle Gass an *A* for putting in the extra time and effort to record an alternative vocal track for the censored album. at least it’s not as jarring as hearing empty spaces or plain nonsense words like Kanye West saying broke-broke during the chorus of Gold Digger. yikes! i’m sure the local celebrities really appreciate their homes being pictured and mapped out in the local newspaper recently. the feature is absolutely stalker-ific! I’m a bit disappointed though… i was thinking that Kristi and Bret would have a bigger place than that. .. and why isn’t the head coach of the Pittsburgh Steelers actually living in or around Pittsburgh??? oh, and a question for the local paper: why list out Trevor Graham’s $351,000 home? it really doesn’t seem to fit with the rest of the high-priced celeb homes, ya know what i’m sayin’? wanna have a jump on the upcoming black friday sales? well there’s an actual website devoted to getting the latest scoop on the deep discounts slated for black friday located here. I personally like to keep up with all the electronic items that are getting slashed in price. but you won’t be seeing me out there at best buy or walmart this year. no way. I had a taste of it last year when i attempted to get a cheap flat screen at a local walmart early that friday morning. yup, a total waste of time. the flat screen was no where to be found. just a massive herd of grumpy shoppers with their shopping carts jamming up the aisles with absolutely no room to breathe. never again, my friend. never again! i’m fighting a losing battle with the leaves, i tell ya. while in the midst of blowing all the fallen leaves off the lawn this morning, my gas powered blower mysteriously freezed up. I couldn’t pull the starter cord, it was stuck or something. i actually had to take the whole casing apart so that i could turn the motor by hand to get it unstuck. there probably was an easier way to get the blower working again but at the time i was a bit frustrated and just wanted to finish up clearing the leaves. once i got the blower put back together, it started up fine but it stopped after a couple of minutes. it looked like the motor got “flooded”… i think that’s the term. i just couldn’t get it started again no matter how many times i pulled the cord. but i couldn’t let the leaves have their way today, no siree. i got out the mower and bagged the leaves that way. at least in the front lawn. since the bag capacity was pretty small, i had to empty it out a bunch of times but it worked. by the time i got the front yard done, i went back to my blower and eventually got it up and running again to finish out the backyard. …alas, my victory didn’t last long. by the day’s end, more leaves have made their way onto my lawn. it almost appears that i didn’t even work on my yard today. …you haven’t seen the last of me and my blower, you hear me leaves!!! i’m not done yet! this might be old news for some but i didn’t realize the creator of VeggieTales, Phil Vischer, is no longer running the business Big Idea Inc. after the bankruptcy back in 2003, apparently Classic Media (a secular media company based in New York) took over. Phil is still involved doing the voice over work for the characters but that’s about it. so the recent mediocre projects like Veggie Tales Live (a live show based on the characters), the NBC saturday morning shows and the awful video games all weren’t his idea. we can all blame Classic Media instead. it makes sense now seeing all the recent marketing and the NBC shows toning down the “Christian” aspect of the VeggieTales. and i was very encouraged by reading Phil Vischer’s story about the bankruptcy, losing the business, losing his employees etc. he went from flying so high with a booming children’s video company and then to see it all crash and burn right before his eyes. through it all, he never lost faith in God and never doubted that his purpose is to tell God’s stories to children around the world. So he’s starting another company and continuing on to fulfill his mission. you can get the behind the scenes scoop on what went down by visiting Phil’s very informative blog.